This osprey put it all on the line defending its young, and paid for it. Sorry, no wildflowers this week, only a sad story. 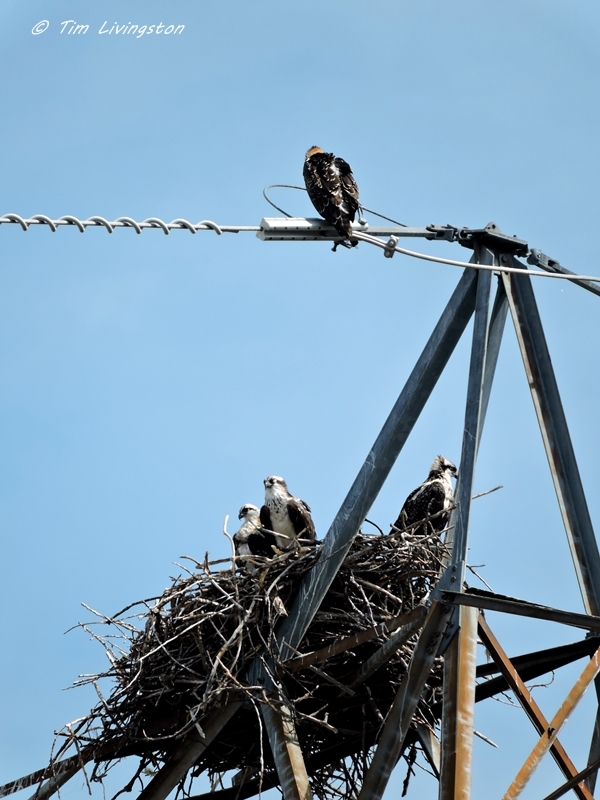 If you’ve followed my blog for a while you may have seen some of my posts about the ospreys that nest and raise their young on a large electrical tower at our mill site. The tower, perched near the Sacramento River, overlooks prime fishing habitat. These birds are practically mascots for our operation. Almost without fail ospreys raise two offspring in the tower nest every year and have done so for decades. The osprey family 2015, just a week before the tragic incident. However, a week ago last Monday, while in our office we heard the sound of a low-flying helicopter. This isn’t unusual except for the helicopter wasn’t just flying over. It was lingering. I strained to look out my window to see the helicopter, but it was just out of sight on the north side of the office. My window faces west. Then I saw an osprey buffeted by the rotor wash being blown off to the southwest. Next, a large bird wing fluttering to the ground outside my window. That got me out of my office and headed for the north end of the building. When I made it outside, the helicopter was gone. One of our foresters, our lead research scientist and her assistant met me. Our scientist was extremely agitated and told us the helicopter had struck one of the ospreys. As we walked out into the parking lot, the mill superintendent walked out from the opposite side and yelled to us. 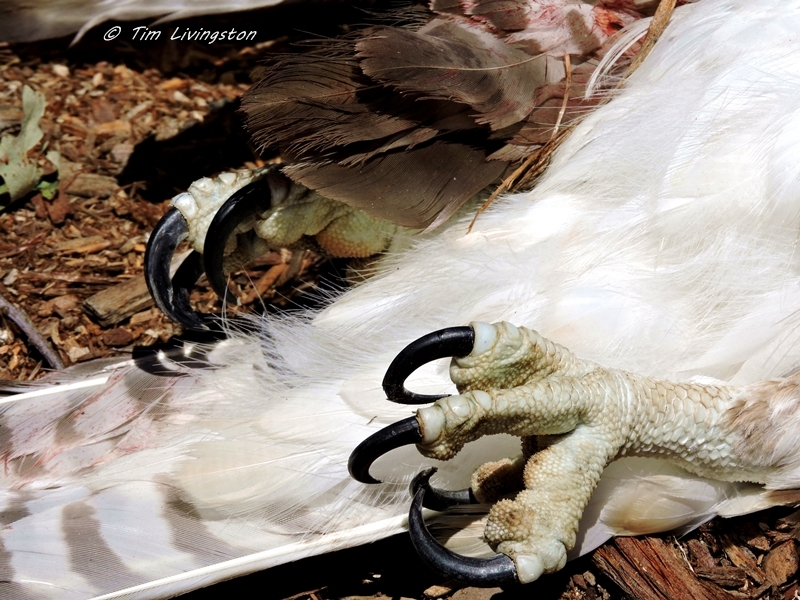 Then he reached under one of the pickups and pulled out the body of the dead osprey. He informed us that a number of the mill workers had seen the incident and were just about in tears. Fortunately, our research scientist got the aircraft identification numbers. 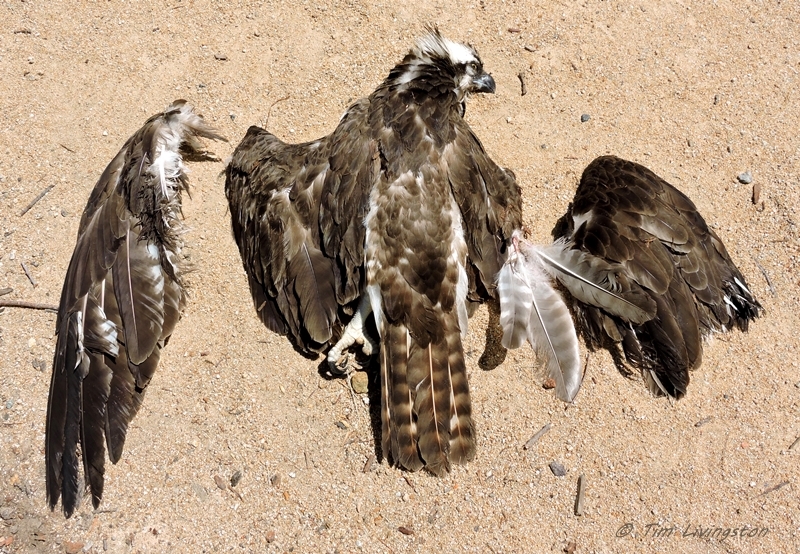 The osprey was cut to pieces defending its nest. She recounted to us how the ospreys became agitated because the helicopter hovered so close to the nest. All four birds were at the nest, both parents and two offspring. The parents took off and were responding defensively. One of the birds began diving on the helicopter trying to drive it away from the nest. On its fourth pass at the helicopter, it was struck by the blades, severing both wings and plummeting to the ground. California Fish and Wildlife was contacted and a warden responded. He collected the remains and took statements. We are awaiting the results of the investigation. I’ve been watching all week, hoping to see the three remaining birds at the nest. So far I’ve only seen two return, but most of the time there’s just one. Both of the offspring can fly and they come and go to the nest. Our biggest concern is that the young are unable to fish on their own. Hopefully, the remaining parent will be able to keep the youngsters fed and that this helicopter incident doesn’t result in three dead ospreys. I’ll keep you posted. If you want to see the previously osprey post just click on the osprey tag below and they’ll come up. This entry was posted in Wildlife, Wildlife At The Mill and tagged birds, osprey, wildlife by foresterartist. Bookmark the permalink. 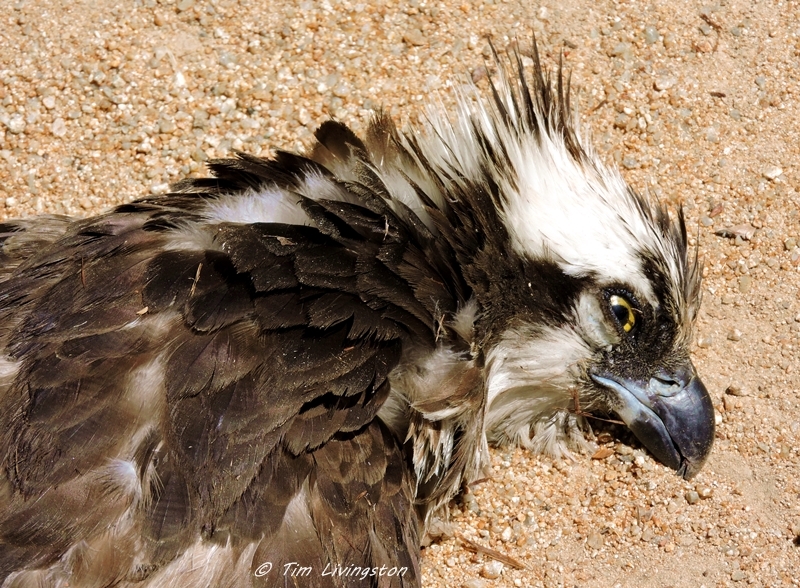 Senseless… If you’ve been following Tim’s Blog (The Forester Artist), no doubt you’ve enjoyed his posts about the Osprey family living near his work. This update breaks my heart. Awful. I will keep my fingers crossed for the remaining ospreys. Just this morning I saw the three of them together. A good sign. I’ll have some pictures soon. I am so sorry for this loss. We were all a bit stunned by it at first. Now everyone is just mad. This is so sad. I hope the family can recover. I’m ‘commentless’…. I’m optimistic today. I saw the remaining parent back at the nest this morning. How tragic! Very saddened by this and so sorry for your loss. Thanks Veronica. It was a pretty senseless death. That is so sad when it happens. I have seen hawks that were killed diving too close to cars. I live in a populated area and we have two Bald Eagle nests nearby. I hope they can stay away from human perils. I know there are always peril for the birds, but the helicopter really caught us by surprise. We’re still waiting to find out what it was doing so close to the nest. I hope so too. On one hand, the remaining parent returned. That really improves the chances for the youngsters. We’re still waiting to hear from California Fish and Wildlife about the investigation. Tragic… Wildlife, too, can become part of our extended family. I’m so sorry for your loss. So true. I’ve worked out of this location since 1992 and have watched ospreys nest in that tower this entire time. It’s like having a favorite neighbor killed. I bit of shock to say the least. I feel devastated for the birds. I hope charges will be brought against the people in the helicopter but that won’t help this family any. I butcher chickens so I’m not squeamish but the photo of the Osprey with the severed wings is just gruesome and made me queasy. Sorry for the graphic photo. Maybe I should have had a warning. I know what you mean about the chickens. This was out of place and without purpose. We’re still waiting the outcome of the investigation. No worries…I think things look more gruesome if you already have a predisposed feeling toward them. I’ll watch your blog for an update. That is a very sad tragedy….keep us posted. The machines of humans and nature don’t always live in harmony. We often occupy so many habitats… Sometimes unintentionally… We must find new ways to preserve biodiversity. There was certainly no harmony this time. We’re still waiting to find out what the helicopter was doing. On the other hand, the manmade tower has turned out to be a premier nest location for these birds. Osprey are very adaptable. That is, except for dealing with helicopters hovering too near their nests. Yes, totally unnecessary. We’re waiting to find out why they were flying so close. If that bird strike had damaged the helicopter, this would be a totally different story. I hope whomever was in the helicopter as well as who owns it gets a fine. Won’t bring the osprey back but hopefully send a message. How tragic!! We’re hoping too, Kathleen. Fish and Wildlife has the aircraft ID number so they know whose helicopter it is, and probably what they were doing. I’m sure they were flying below allowable altitude, unless they had some special approval. There could be a number of violations. We’ll see what happens. Very sad. Such a horrible death. It was pretty horrible for the bird. Now everyone here is just mad. It truly is. There was no reason for it to happen. The helicopter should never have been that close to the nest. This is difficult to read and digest. We were stunned here. When I saw the wing fall from the sky, I thought there had to be some other reason for it. So awful Tim – I mean what the heck was the helicopter doing. I hope there is an explanation and then a hefty penalty after investigation. Really very sad. I don’t known what the pilot was doing, but when we find out I’ll let you know. There’s not much for me to add, as I think your other posters have said it all, Fingers crossed that all goes well for the remaining birds, and I hope the helicopter crew get caught and get their comeuppance, So very sad. Indeed Arlene, I couldn’t agree more. Fortunately, the remaining parent is actively working on teaching the young how to fish. Thanks Anna. You are absolutely right. That bird was fearless. This was so hard to see. Just devastating. The stupidity unbelievable….really sorry this happened. Thanks Terry. So are we. Stupidity is a kind way to put it. Nice to hear from you. We are all wanting to know the answer to that question. I’ll let you know when we find out. Just a tragic and senseless loss. I hope the youngsters make it. After watching them over the last two days, I feel pretty optimistic about their success. more times that I care to think about…human beings can be stupid to the max…why would anyone with a brain think it’s a good idea to take a HELICOPTER close to nesting birds??? That is the question we’ve all been asking. Hopefully, we’ll find out what was going on eventually. Unfortunately, It won’t help that osprey. The more I think about it the more bizarre it seems. That is so sad. It breaks my heart. Yes, it was very senseless. What a brave bird – going up against what it probably perceived as a much larger (and noisier) predator bird. I’ve seen sparrows go against crows to defend their nests, but unfortunately helicopters don’t retreat the way crows do. So sad. Did you ever find out why that helicopter was there? Brave and fierce, but a little outmatched, even if he didn’t think so. We haven’t heard yet what the helicopter was doing, but I will share when I find out. I’m glad you someone got the N numbers and the helicopter owner can be identified. I kind of think maybe they were trying to get a closer look at the nest without thinking of the consequences.